We had a great time at Central Park today, and it was a pretty good turnout. When we showed up, there were about 50 people there, and the kids had already blown through the 50 cups of cocoa (Daddy made some at home later). It was getting a little bit melty on top, so it was a combination ice skating/muck-about-in-the-slush outing. . . should have worn snow pants. And I brought my fancy shovel, but I guess I was a little ambitious thinking that I could ice skate, help little J, and shovel. I’m often a little bit too ambitious. Instead, I sort of shouted out to random strangers that anyone could borrow it and people looked at me and seemed to be thinking, “Wow, I hope that lady who loves her shovel will quiet down and skate away.” So I did. All Over Albany reports that Van Schaik Park in Cohoes is clear. Click the link to see it in all its splendor. 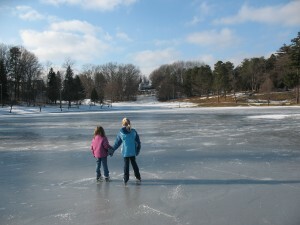 Saratoga Spa State Park: friends report that this is clear and nice and the warming hut is a bonus. The rumor I heard is that the Crossings in Colonie clears ice and posts a sign by the road to let you know if you can skate on any given day–I tried to call them to confirm today and I got a machine. 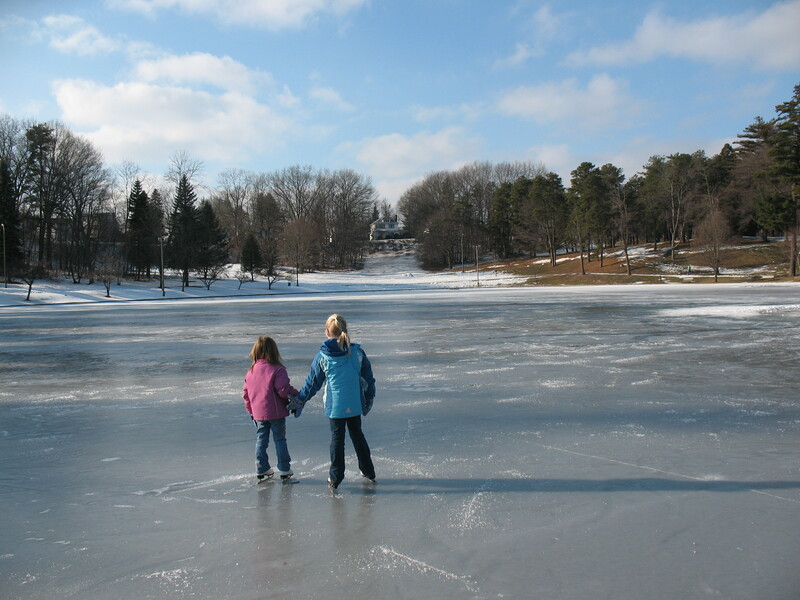 Capital District Parent Pages says that there’s outdoor skating in Glens Falls at Crandall Park or East Field, but I wasn’t able to find much additional information on these. CDPP also talked about Swinburne Park in Albany, and I found a bit more information on that one–click the link. Looking at my ice skating notes, I stumbled on snowshoe information for Guilderland that I must have misplaced when I was doing that post–sorry! I’m feeling a little bit guilty that this post is not quite as well-researched as I hoped it would be. . . but I’m tired! Played tag ice skating with Madeleine and it has worn me out! Plus, there’s a photo! That’s a new skill for me. I think I’m going to go take a nap. . . .